Maybe this is a good thing, a positive step for middle class Americans and a rally cry to balance the budget, but in reality, all she really wants is to be left alone. Either way, Mr. Buffett's op-ed in the New York Times started all this mess, when he claimed he payed less taxes than the others in his office, and the President decided to use it as a talking point. It does sound bad, in theory, when Warren and his "super rich friends" can pay less tax than their underlings. Buffett clarifies the real issue, which is the "effective tax rate," not the amount of tax actually paid (Buffett claims he paid millions in actual taxes). The math is pretty clear: if you work for someone, you are probably going to pay more "effective tax", as you are paying into the income tax system that has graduate rates up to 35%, and the payroll tax systems which fund your medicare and social security. If you make money from trading stocks or other securities, capital investments, rents, and some dividends, you are mostly operating under the capital gains tax regime, which has variable rates starting as low as 15%. 15 < 35, so the bankers beat the wage-earning middle class in effective rates. Even if you are anti-tax, its hard to argue with Buffett, a billionaire who not only pledges to give away his wealth in the end, but who advocates to pay more taxes NOW. A balanced budget proposal will likely propose changes to the upper reaches of the income tax and could potentially affect capital gains rates, but a system where capital gains rates change based upon how much you earn would be very difficult to put in place, let alone enforce. This brings us to the recent GOP presidential hopefuls, who many claim will "throw out the tax code" and offer a consumption tax, flat tax, fair tax, 9/9/9 plan, etc. Some of these ideas could work, others just don't, and others only work in certain environments. We will analyze these in the coming weeks, but for now, enjoy watching the AL West champion Texas Rangers attempted run to another improbable spot in the World Series. One of them, anyway. 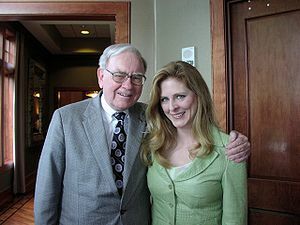 Turns out Berkshire Hathaway has more than one secretary (there is another named Debbie).